Mayor Eduardo Paes has closed the Engenhao Stadium indefinitely. This has thrown the Carioca football schedule into a state of chaos, as there is the remainder of a state tournament to play, and the Copa Libertadores tournament to play later this year. The stadium was closed due to problems with the structure which raised safety concerns. The match between Fluminense and Macae last night was moved to another stadium – the Sao Januario stadium in Vasco. The stadium is still relatively new, with it opening in 2007 for the Pan America games. 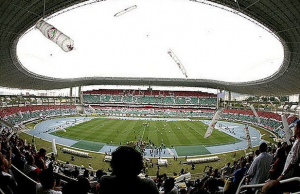 The closing has caused embarrassment as the city gears up for the 2014 World Cup and the 2016 Summer Olympics. The new Maracana stadium in Rio is still being completed, leaving Rio’s four large teams with only one major stadium. The Sao Januario, Moca Bonita, Taca Rio, Copa do Brasil, Libertadores, and the Bangu stadiums will be used alternately for the games, however the Copa do Brasil and Libertadores stadiums do not have proper lighting for evening, making night games impossible. Instead, night games will be played in the meantime at the Moacryzao and Raulino de Oliveira stadiums.